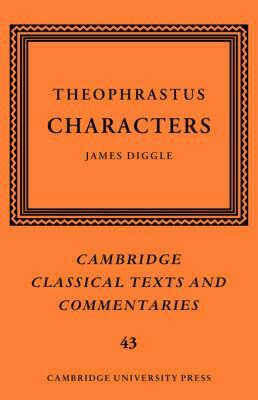 Theophrastus' Characters is a collection of 30 short character-sketches of various types of individuals who might be met in the streets of Athens in the late fourth century BC. It is a work which had a profound influence on European literature, and this is a detailed and elaborate treatment of it. This edition presents an improved text, a translation which is designed both to be readable and to bring out fully the nuances of the very difficult Greek, and a commentary which covers every feature of the text and its interpretation and offers particularly full elucidation of the often enigmatic references to contemporary social practices and historical events. There is also a lengthy introduction, which discusses the antecedents and affiliations of the work, its date, its purpose, and the manuscript tradition. Extensive indexes are also provided, including an Index Verborum. Preface; Introduction: 1. Theophrastus and his times; 2. The nature and purpose of the Characters; 3. Date; 4. Transmission; 5. Some texts and commentaries; Text and translation; Commentary; Abbreviations and bibliography; Indexes. James Diggle is Professor of Greek and Latin at Cambridge and a Fellow of Queens' College. His publications include Studies on the Text of Euripides (OUP, 1981), The Textual Tradition of Euripides' Orestes (Oxford University Press, 1991), and Euripidea: Collected Essays (Oxford University Press, 1994). He was University Orator at Cambridge for eleven years, and has published a selection of his speeches in Cambridge Orations 1982-1993 (Cambridge University Press 0521 466180).